After all the participants arrived we enjoyed a Peace trail, guided by Servas member Yaffa Kfir, including magnificent views of both East and West Jerusalem, and a visit to St. Claire's Convent where one of the nun's shared with us the story of the convent and invited us to read St. Francis's peace prayer in their modest chapel. - Yossi Harel encouraged us to search for inner peace in the coming year. - Dan Sheffer spoke of his childhood memories in divided Jerusalem and Ruth shared a poem Wildpeace by Yehuda Amichai. - Roni Dunitz spoke of his exciting project: monthly group meetings with Jews and Arabs from the Sharon area, inspiring us with hope. - Meir Hayoun shared several Peace poems read by the participants. After the talks we shared the traditional apple in honey for a good and sweet New Year. 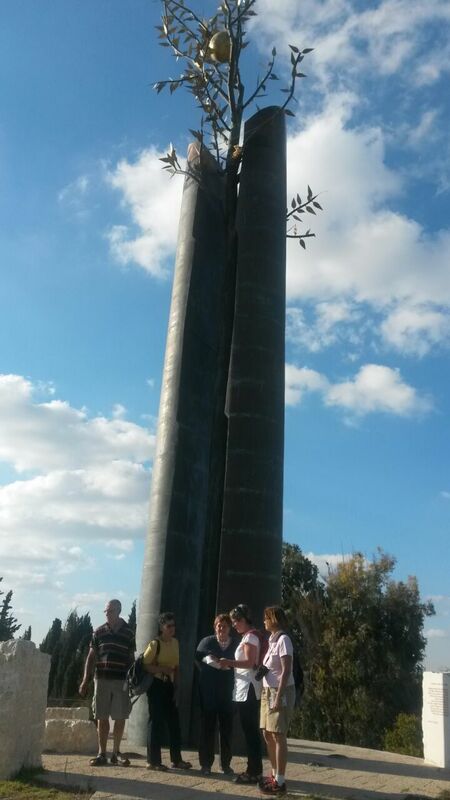 Finally, we visited the nearby Park of Tolerance with its skyscraping statue of a bronze tree among whose branches are seeds of hope.